Designed by space mission experts, have fun learning about the night sky stars, constellations, and science. Players race to collect the right number and types of stars to complete constellations to fit the needed pattern — are B-type stars or F-types required to complete the constellation? Strategically collect the right stars, reserve patches of the sky for observation and explore the universe. Once you have your constellation, add it to the map of the night sky being assembled right in front of you. The closer you get to putting together the actual map of the heavens, the more points you score. The game involves drawing Star Cards, which represent the seven types of stars classified by astronomers. Each constellation requires a unique combination of star types to place in the sky. As the game progresses and more constellations fill up the night, players must use their puzzle skills to fit the constellation hexes on the board to score the most points. The player with the most constellation points at the end of the game wins. Great STEM Game: Learn about star science and the stories behind many constellations! We have included a twelve-page Stargazing Handbook with the game. This special feature enhances game play and the educational experience by providing more information about star science and constellations. Read a brief introduction to astronomy, and then turn to the science behind the stars. Find a great chart that outlines the main sequences of stars, and learn how astronomers classify different star types. Enjoy reading the brief stories behind the different constellations in the game. In the end, complete the special constellations crossword puzzle! Thirty-Six Hex Constellation Cards, on heavy cardboard. All original art, with scientifically correct star placement and pattern. On the reverse of each Constellation Hex Card, find the number and classes of stars that make up the constellation and clues for how the constellation fits in the night sky. 72 Star Cards with the stars classified using letters O, B, A, F, G, K, and M, which is a short code summarizing the star’s properties such as temperature, density, and composition. Inspiring the next generation through engaging space-related STEM games. Following on the success of our debut game, Xtronaut: The Game of Solar System Exploration, we created Constellations, and more to come! Xtronaut met with huge success, being named a Best Family Board Game for 2016 by Good Housekeeping magazine, a Top-5 STEM Toy by City Kids magazine, an Awesome Math Game by MathsInsider, the Top Solar System For Kids Science Toy from Fractus Learning, and more! Xtronaut has received positive reviews from players and parents. Based on this success, we continue to grow our team and expand our line of fun and educational games. 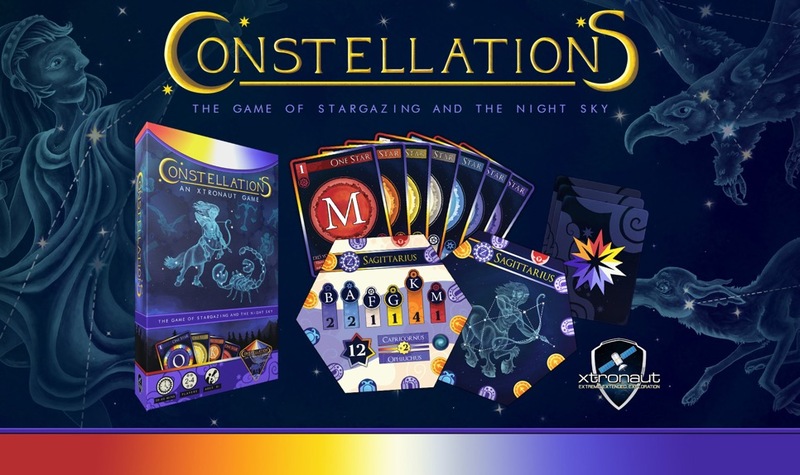 Dr. Dante Lauretta led the creation of Constellations working closely with Ian Zang, who had the original inspiration for this game and worked hard with our team as the game’s Lead Designer. Graphic artwork was led by Ashley Kenawell. Dante is a Professor at the University of Arizona, which is one of the leading global institutions in astronomy, and the leader of the NASA OSIRIS-REx asteroid sample return mission. Mike Lyon, co-founder of Xtronaut, is a leader in the space tourism and New Space areas. Mike and Dante are creating space-related games that combine incredible STEM content with fantastic game play! Picture above: Dante with OSIRIS-REx and asteroid Bennu models, Mike in Soyuz simulator with Russian commander. Terrific artwork, real science, and fun 10 star game play! Working together as a creative team!